Sometimes you don’t have to go far to experience something special. This past weekend was all about the CRASIS Masterclass and Annual Meeting, which takes place in Groningen every year. CRASIS is our interfaculty framework for research into the ancient world, incorporating colleagues from religious studies, philosophy, archaeology, classical studies and history. Besides a monthly lecture, the group organizes an annual conference for early career researchers, with a Masterclass for graduate students. 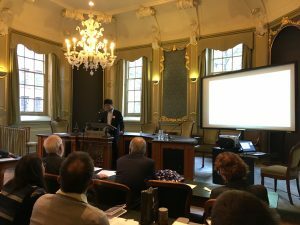 This event gives us the opportunity to invite a renowned scholar to preside over the Masterclass and to give the keynote lecture, and this year the invitee was none other than the great John Ma! This year’s theme, ‘Motivation and Causality’, nicely fit with my own subject, which often involves looking at the motivations for inscribing texts. All in all, this was a great opportunity to get feedback on my research from the very best, so I made sure to sign up for the Masterclass. All in all the event, besides being very useful, was also a lot of fun. As an added bonus, my colleague Eelco who organizes the conference had invited me to the welcome dinner for prof. Ma that was hosted the day before the conference, which was very enjoyable and an excellent opportunity to get to know him a little bit in advance. Turns out Ma is a really big Star Wars fan, who knew! The Masterclass itself, which took place on Thursday, was excellent: we heard nine papers of very high quality, and as everyone was asked to comment in-depth on the paper of one of the other participants, the discussions that followed each paper were on an equally high level. The comments by John Ma then followed at the end of each time slot, which rounded off the discussion nicely, and always provided food for thought. I was quite happy with my own presentation, especially since the comments provided by Ma and by my respondent Dies van der Linde, who is doing his PhD at the ICS in London, were very useful. Dies asked me about the role of competition between cities in the relationships between them, which made me realize that it is important to incorporate that aspect a lot more. Ma’s commentary focused on ‘reading the evidence against the grain’ a little more, which I think comes down to the same thing: looking behind what the texts promote a little more, and thinking about why they promote it in this way. But most of all, it was great to meet all the participants, who all did excellent work and with whom it was a pleasure to have dinner and a few drinks afterward. It is always a privilege to meet other graduate students, and the intimate and informal environment of the Masterclass (there is no audience present) always gives a very stimulating opportunity to do so. A great success!